As will proven throughout the July SPOTLIGHT issue focused on him. 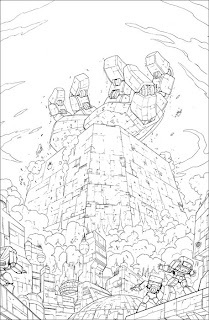 Or as evidenced by this variant cover lineart by Guido Guidi. Would really make a Metroplex vs Trypticon battle absolutely terrifying. I'm looking forward to this, although at the same time I'm absolutely gutted as I had a Metroplex Spotlight outline I was hoping to pitch that would have been a hell of a ride! Can't wait to buy this though and compare!